Crate training benefits you and your Weimaraner because, when done correctly, your dog feels secure and your life is simpler. Your Weimaraner will have his own special space to feel safe and comfortable. And you will have piece of mind that your dog and your home are both safe from harm. Why are so many people choosing to crate train their dogs? Because it makes controlling your puppy’s actions so much easier. You know where she is. She can see you and knows that you are close. And your puppy learns how to behave, so that you don’t have to constantly scold her. 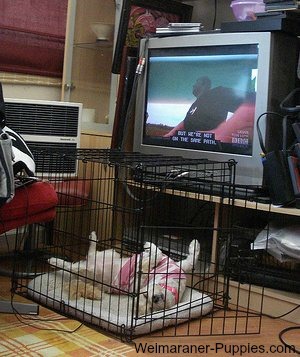 This happy dog is content and secure in her crate. 1. Your dog will have his own special space to hang out in. Often times his crate will also serve as his sleeping place. 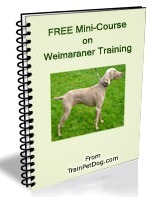 It is a comfortable place where your Weimaraner can eat, sleep, or even play with his toys. You might also find that crate training benefits you and your Weimaraner, when its time for your household chores. It’s not easy to sweep, mop, vacuum, etc. when you’ve got an excited dog shadowing you. The crate can serve as a babysitter so to speak. Just be sure that you are using the crate training method appropriately. 2. The crate is a place where he will feel safe. If for some reason, you aren’t able to keep an eye on your Weimaraner, you can crate him to keep him safe from any mischief he could get into while he’s unsupervised. Weimaraners are easily excited, if you have company. Your dog’s crate can be a safe place when strangers come into your home. 3. He can recuperate from injury in his crate. What better place to recuperate from injury than a place where you feel safe and secure. If your dog is injured he probably shouldn’t be very mobile. Crating him will keep him from trying to follow you around the house, and will enable him to get some much needed rest for healing. 4. The crate will keep your dog safe while traveling. Your Weimaraner will have his own special space in an unfamiliar place. This will bring him comfort and will make traveling less stressful, if he’s already used to being crated. Additionally, a crate is required by most hotels where pets are allowed, because hotel owners don’t want your dog destroying their property (carpet, furniture, etc.). 5. Crating your dog can help with separation anxiety. Leaving an anxious dog alone in a big open space (such as your house) leaves room for lots of destruction. It will also eliminate the opportunity for your dog to get into dangerous household items (he could be poisoned or electrocuted). It is important to note that crate training is not a cure for separation anxiety; your dog can still hurt himself by trying to get out of his crate. You have more work to do in order to solve this behavior issue. 6. Crating your dog helps with house training. Crate training is one of the most effective ways to assist with house training a dog. Since your Weimaraner will consider his crate like a den, he will not want to go potty where he eats and sleeps. Do not leave him in his crate too long or else he won’t have a choice. But crate training will help your dog understand that he needs to “hold it” until he is let outside or to his designated potty area. The crate training benefits listed above all boil down to eliminating stress for you and your dog. The crate training benefits weigh heavier than the arguments against it. Just because you wouldn’t want to spend any time in a crate doesn’t mean that it’s bad for your pet. Remember that dogs like dens, and that is the purpose the crate serves. A dog crate gives your dog the feeling of a den. Just be sure to follow these very important rules of crate training so that the crate training experience is a happy one for you and your dog–and you both enjoy the crate training benefits.